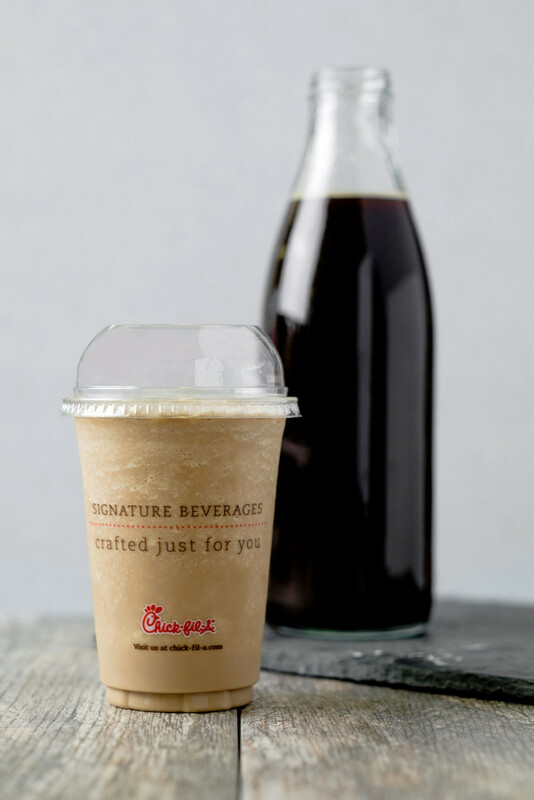 ATLANTA, Ga. (March 8, 2016) – This spring, Chick-fil-A® is taking cold-brewed iced coffee to the next level, introducing Frosted Coffee for customers beginning Monday, March 14 at restaurants nationwide. Frosted Coffee is made by combining Chick-fil-A’s signature vanilla Icedream® with THRIVE Farmers™ cold-brewed iced coffee. The hand-spun treat starts at just 240 calories, offering fewer than half the calories of a milkshake. Chick-fil-A’s cold-brew iced coffee process is typically reserved for specialty coffee houses, providing a hand-crafted taste. Unlike traditional techniques in which hot-brewed coffee is cooled and later iced, Chick-fil-A’s cold-brewed coffee is never heated; instead coffee grounds are infused with cool, filtered water and steeped using proprietary equipment for up to 24 hours to create a concentrate that is naturally sweeter with low acidity and bitterness. This is then blended with Chick-fil-A’s signature Icedream®. Chick-fil-A’s Icedream® is a delicious, dairy treat with an old-fashioned vanilla taste. The launch of Frosted Coffee comes on the heels of the successful launch of Frosted Lemonade in 2015. Frosted Coffee will be available in a small (14-ounce) or large (20-ounce) serving with prices starting at $2.69 for a small. A limited-time menu option, Frosted Coffee will be available through May 31, 2016. Chick-fil-A partnered with THRIVE Farmers Coffee in 2014, becoming the first in the quick-service industry to offer specialty-grade coffee. The sale of each cup of coffee provides direct revenue to the THRIVE Farmers network of family farmers in Central America. The farmer-direct platform allows the farmers to earn up to 10 times more than farmers earn in traditional revenue models. For more information about Frosted Coffee, THRIVE Farmers Coffee and stories about the company’s food, people and customers across the country, visit the News section of thechickenwire.chick-fil-a.com.